In contemporary globalization, migrations to Europe have accelerated in speed and scale. Over the last decades, there has been an increase in negative attitudes towards immigration, and many studies have emphasized marked differences in the strength of anti-immigrant attitudes among European countries. However, very few studies performed a rigorous statistical assessment of the issue. A new index measuring the level of perceived threat from immigrants is proposed and applied to a data set covering 47 European countries and regions. The results show that Malta and Cyprus have the strongest perception of socio-economic threat from immigrants, followed by Austria, Great Britain, Northern Ireland and Hungary, and that the countries/regions with the weakest perception of threat are Armenia, Sweden, Romania and Northern Cyprus. It is shown that the proposed index has many theoretical and practical advantages over the existing indexes of perceived threat from immigrants. 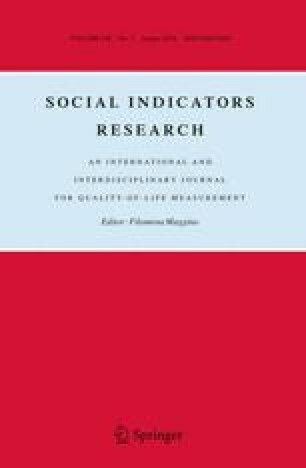 The robustness of the index is assessed using uncertainty analysis. It is very important for policy makers to monitor the level of perceived socio-economic threat from immigrants because negative attitudes towards immigrants make integration difficult and affect social capital, a key aspect of societal wellbeing and economic development. Monitoring is the basis for further political measures aimed at fostering immigrant integration. The proposed index is a useful monitoring tool, an entry point for the ongoing debate on tolerance and can spark further research for a better understanding of the issue. European Commission. (2010). Future of Europe. Standard Eurobarometer, 71. http://ec.europa.eu/public_opinion/index_en.htm. Accessed 21 Dec 2014. European Commission. (2012) Discrimination in the EU in 2012. Special Eurobarometer, 393. http://ec.europa.eu/public_opinion/index_en.htm. Accessed 12 April 2015. European Commission. (2014a) Future of Europe. Special Eurobarometer, 413. http://ec.europa.eu/public_opinion/index_en.htm. Accessed 14 April 2015. European Commission. (2014b). Public opinion in the European Union, first results. Standard Eurobarometer, 82. http://ec.europa.eu/public_opinion/index_en.htm. Accessed 18 April 2015. Marozzi, M. (2015). Skills and training requirements of municipal directors: A statistical assessment. Quality and Quantity. doi: 10.1007/s11135-015-0192-2. OECD. (2008). Handbook on constructing composite indicators. http://composite-indicators.jrc.ec.europa.eu. Accessed 14 April 2015. OSCE. (2013). Armenia: A migrant integration policy index assessment. OSCE Office for Democratic Institutions and Human Rights. http://www.osce.org/odihr. Accessed 21 Dec 2014. Poletti, M., & Regalia, M. (2014). Economic or cultural threat? Orientations towards immigration and European integration among EU citizens and national parties over time. KING Project—Political Science Unit Desk Research Papers, 5. http://www.king.ismu.org. Accessed 26 Mar 2014.